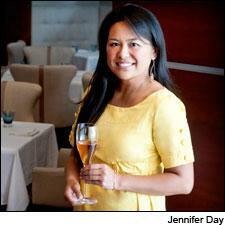 Sommelier June Rodil says it's important to take it slow when visiting a wine region. Visiting just one or two wineries a day leaves room for experiencing culture. Austin, Texas-based sommelier June Rodil has worked with some of the city’s top chefs and traveled to wine regions all over the world, but credits her lifelong love of fine dining to her family. Born in Manila, Rodil moved to Dallas at the age of 5 with her parents, who worked long hours in medicine and enjoyed going out to eat during time off. "They loved having their family around a table," she said. Rodil’s entry to the wine business, however, wasn’t exactly planned: While at the University of Austin, she took her first restaurant job as a waitress at the Driskill Hotel with chef David Bull, and she was hooked. She has notched time as the beverage director for Austin hotspots Uchi (a renowned sushi restaurant) and Congress (New American cuisine), and recently announced a move to join Uchi chef Paul Qui to manage a new multitier project that involves trailers for casual fare, a fine-dining outpost and a great wine and spirits program. She recently spoke with Wine Spectator to share how she gets better at blind tasting, tips for pairing cocktails with food and advice for traveling to wine regions. Wine Spectator: Do you have any tips on pairing wine with food? June Rodil: You have to drink what you like, even if it goes against what you've heard about. But if you're really looking for the experience of your food and wine creating something different together, almost like a chemical bond, then you have to figure out what you want to highlight. For me, I always go with weight first—balancing the weight of the wine with the weight of the food. And then whether I want to highlight a protein or the auxiliary things around the protein. WS: What will the beverage program look like at your new project, Qui? JR: For the flagship restaurant, there’s going to be a tasting menu component, so all of the wine, beer and spirits pairings will change every day. Just like everything else, you want that to be as seasonal as possible. WS: How do you introduce wine people to spirits pairings? JR: We need to ruffle up the industry a little bit. It’s so sad that there’s only wine people and only spirits people and ne’er do they ever meet. We’re all drinking, and we should be happy. It’s very traditional to have wine pairings for food, but it’s much easier to pair spirits with food when it’s a pure spirit. Two composed things at once muddle a focused vision. I like to start people off with a pure spirit instead of composition [mixed drink] as a pairing. That’s just me. I’ve had cool composed pairings, but generally with a cocktail, I like the food to be more simple. It’s like when you start listening to jazz, you might listen to Duke Ellington, but then later, you might get into Sun Ra or Ornette Coleman, something more experimental. JR: It's not gigantic—300 to 400 bottles. The things that I often miss when I'm blind tasting are the things I don't drink enough of, like Zinfandel, Malbec, Torrontés or Pinot Gris, so right now I have increased my collection of those. And then I love Champagne and I love Burgundy, so those are in the collection. I bought a mixed case of Sylvain Cathiard. I have a magnum of Rapet Pernand-Vergelesses Sous Frétille 2009. I like large formats. I just went to Australia and brought back some Grosset Hill because they don't import that in Texas anymore. WS: You travel a lot for wine. Do you have any advice for visiting wine regions? JR: Have an itinerary. Set your appointments as far [ahead] as possible. You have to be respectful with what's going on with the producers. Also, don't set up too many appointments. As a consumer, if you love wine, you probably also love culture and food. I would do one appointment in the morning, have a great lunch, set one other appointment and then relax. For example, if you're in Burgundy, go check out the Moutarderie, the mustard museum. Or go to the Beaune market on a Saturday, and you'll probably run into a famous winemaker there. I've seen people following Dominique Lafon [of Comtes Lafon] around—that's the experience.